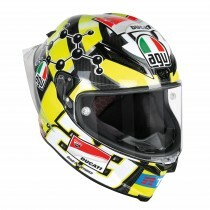 AGV racing helmets are worn by top class motorcycle racers such as Valentino Rossi, Guy Martin & Andrea Iannone. Here you will find some of our most aerodynamic motorcycle helmets to keep that wind drag down so you can hit those top speeds. Our top performing race helmets are perfect on the track and are some of the most protective motorcycle racing helmets around. Sepang, February 6, 2019. AGV and Valentino Rossi are pleased to reveal the Winter Test 2019 Livery created for the first tests go the year, to be held on Malaysia’s Sepang International Circuit. The brand-new design showcases the shapes and neon colours that make the Pista GP-R helmet a true work of art. The ultimate motorcycle race helmet is here. Features include a built in hydration system, MotoGP-developed metal air vents and a wind-tunnel-tested “biplano” spoiler that has multiple wings to maximise aerodynamic performance and add stability at high speed. The 100% carbon fibre shell’s shape is designed to minimise interference with the racing suit, while the interior has an adaptable fit and places no stitching in sensitive areas. 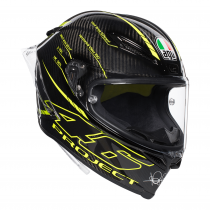 The AGV Pista GP R Project 46 3.0 has set the bar for all race helmets. 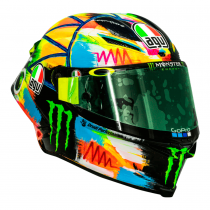 The AGV Pista GP R Soleluna 2018 is the latest addition of Valentino Rossi's replica helmet collection. 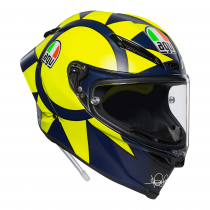 As used by the Doctor himself, this is the perfect choice for any fan of the Moto GP legend. 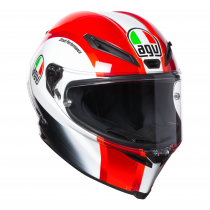 AGVs's top of the range full face track helmet is now even better, with an included hydration system, MotoGP-developed metal air vents and a wind-tunnel-tested “biplano” spoiler that has multiple wings to maximise aerodynamic performance and add stability at high speed. The 100% carbon fibre shell’s shape is designed to minimise interference with the racing suit, while the interior has an adaptable fit and places no stitching in sensitive areas. 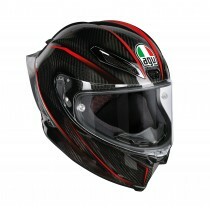 The Pista GP R is the pinnacle of motorcycle sports helmets. 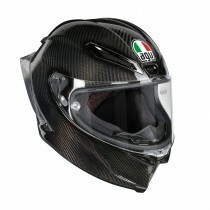 The full carbon fibre shell is designed for an anatomical fit with your leathers for optimal slipstream. The Pista GP R also has the hydration system installed. New for 2019 is the stunning Staccata design. The top of the range track helmet is now even better, with an included hydration system, MotoGP-developed metal air vents and a wind-tunnel-tested “biplano” spoiler that has multiple wings to maximise aerodynamic performance and add stability at high speed. The 100% carbon fibre shell’s shape is designed to minimise interference with the racing suit, while the interior has an adaptable fit and places no stitching in sensitive areas. The New Corsa-R offers most of the same features as the top-of-the-line Pista GP R but in a carbon-fibreglass shell and adjustable vents, the Corsa R is designed for uncompromising performance on the track. A new interior construction provides a stable, pressure-free fit, and the patented, reversible crown pad features two distinct fabrics, allowing riders to select between warm and cool sides depending on conditions or personal preference. 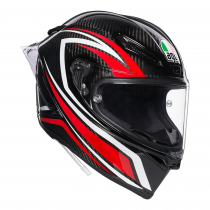 A removable nose guard and wind deflector are both included, and the Integrated Ventilation System (IVS) places intake ports at areas of maximum airflow. 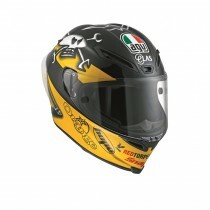 Now available as a Guy Martin replica! Great for any Guy Martin or IOM TT fans!